Is Diamond the father of Hamisa's child? Tanzanian model Hamisa Mobetto excited the grapevine after revealing her baby's name. Well, guess what? The baby's surname is similar to that of Tanzanian musician Diamond Platinumz. Hamisa on Friday shared on Instagram her son's name as Abdul Naseeb, Diamond's surname, fuelling speculation on the identity of the child's father. The model also renamed the baby's Instagram account and added a description that the boy is a lion. Diamond often uses the name Simba on stage. Hamisa is already the mother of a baby girl. But unlike her first born's Instagram account that names her baby daddy Francis Sizo aka Majay, Hamisa's second born son's page only captures her name as the mother and the Naseeb surname. Diamond, in a past interview, insisted that his relationship with Hamisa was professional during the shooting of the Salome video. He denied claims that the two are an item and even suggested he is unaware of her pregnancy. 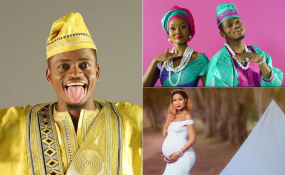 He held the interview to deny reports that his alleged relationship with Hamisa was ruining matters with his baby mama Zari Hassan.